At the moment I am so sleepy I can barely keep my eyes open. These all day hospital visits and kid running is killing me! Bob had his bazillionth surgery today and seems to be doing ok.....lots of pain but ok :) I haven't gotten to talk to the doc yet so no clue on how he thinks this is gonna go, how long til Bob comes home....nothin :( When I get a clue I will share!! I sat down tonight to scrap......I had seen a stunning layout somewhere but I can't remember where or who it was by.....so I can't tell you who I ripped off.....LOL. Sorry!!! 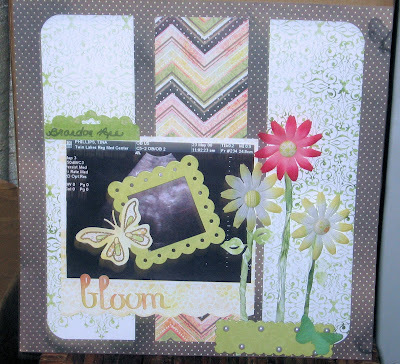 I have a lot on my already feeble mind right now :) Also somewhere in my blog hopping travels I came across this blog called Lasting Moments Layout Challenges. They are a pretty new blog and are really trying to get their name out there. And we all know what a sucker I am for a challenge blog.......I was totally stunned to find I officially "follow" over 1,000 blogs. No kidding! I need help.......LOL. So this weeks challegne is simplicty. Hmmmmmm...............I was looking for a catch or the fine print but didn't find any!!! But even if I didn't we all know I'd be this far behind......LOL. I know I am babbling incoherently......you may need a translator by the time I finish this post.....told ya, I'm tired!!!!! Thanks for looking.......I hear a bed calling my name!!! Hi Tina! Isn't this darling! I love how you did this LO and nope, no fine print...just a simple LO is all we're looking for and this is just perfect. Thanks so much for joining us this week at Lasting Memories and we'll keep an eye out for a friend! You still have a chance anyway for being a first timer too!! Beautiful LO, and I hope things start looking up for you!!! Hope you can all get some rest soon! I wish I had your talent Tina, you really do an amazing job..
Poor baby. You should exhausted!! I hope you got a good night's sleep. Such a tough time for you and your family. Hope this is his last surgery!!!! Your layout is gorgeous. But um, 1000 blogs?!!! Makes my 300 sound like nothing, lol!!! Beautiful layout! Thanks for playing over at Lasting Memories... wea re so happy everytime we get a new follower! Hope you can bring a friend and win our candy!! !